Lovely ambiance, nice variety of menu, good quality of food, overall a very nice experience. Would recommend. Service was below standard. I made a reservation for a table for 3. When I arrived I asked the waiter if it was possible to sit upstairs. The waiter responded this was not possible. Less than 10 minutes later another person entered and asked for a table upstairs and was granted the request. I asked for an additional salad which came late. The standard salads were not served. Even after asking for it. I do like this restaurant very much and this first time I have a bad experience. Interesting menu with reasonable selection. Friendly service. Great location particularly got the Concerteubouw. Delicious options for vegetarian, pescatarian and carnivores in our dinner group.. Other than the avocado soup being a bit disappointing we enjoyed the entrees . The venison, hare and fish of the day were all cooked perfectly. A chance booking on a Sunday night and close to our hotel. The reviews looked good we weren’t disappointed. Although there was only one available reservation slot, 6:30, the place wasn’t full and we realise now that no later slots were open because they close fairly early. I chose a boar ham and cranberry chutney starter, which was delicious, subtlety flavoured with a slight peppery edge; followed by a the venison steak special, which had a wonderful sauce, including a roasted pear. My partner enjoyed a toasted goats cheese salad which had an entertaining mixed salad that included capsicum and walnuts, followed by a delicious chicken stew. Neither of us needed a dessert and enjoyed the last sips of a chilled Fleurie (we were offered the choice if chilled or room temperature), I enjoyed a Genever whilst we had an interesting converdation with the poet and photographer at the next table. Definitively a memorable evening in a restaurant with high culinary standards. The restaurant was lovely, the staff were so welcoming and friendly and the food was beautiful! Great meal. Had the snails and calves liver and both were excellent. Very enjoyable meal. Very friendly and excellent food. We wanted a nice place near concert hall. This is an established restaurant with nice wood interior and professional wait staff. I had excellent grilled sea bass with superb vegetables and my husband had the half lobster. We loved both. And waiter made excellent recommendation for local beer. Hope to go back! We had delicious food and great service, plus the restaurant has a nice ambiance. Would definitely return and recommend to others. 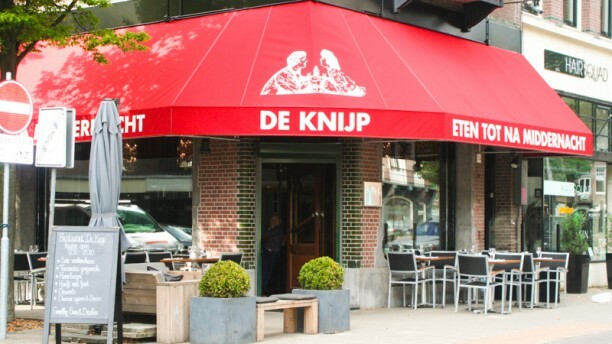 Excellent, very Dutch steakhouse. Also good fish. Busy with many locals. Not cheap but good value for a quality meal. Friendly staff, good atmosphere and fast prepared and very good dishes. We have an appointment for 16:15 and also official confirmation that day. When we arrived we was told that they start at 17:30, so we have to wait 1 hour and 15 minutes. We was told that staff is on vacations for next three weeks, that why they open at 17:30 and didn't change approach on their web-site. When we make an appointment, we wrote out contact number and e-mail, why you didn't inform us? For what reason do we write our phones and e-mails if you don't inform us they you don't work? For promotion letters? We was with our child, who is 4 months old and after we was told that we could have lunch we have to find and new place to eat which took us next hour. This was not nice experience. Nice local place with charming staff, good outdoor seating, a pleasing menu, good tasting food and fine value. Two drinks, a pate appetizer, two meals, VAT and service for 60 euro, no complaints. We had Easter dinner here and the special of the night was grilled lamb for 12 euros. The food was fantastic. The lamb was tender and perfectly cooked. My kids had salmon which they liked very much too. I would go back again. Thanks for the great meal. Prettig en lekker, helaas aan het begin wat matige geuren.